The WUD-2x series ultra high purity transducers combine state-of-the-art transducer concepts with analogue output signals. Thus the safest and most accurate pressure measurements necessary for today’s market requirements are provided. 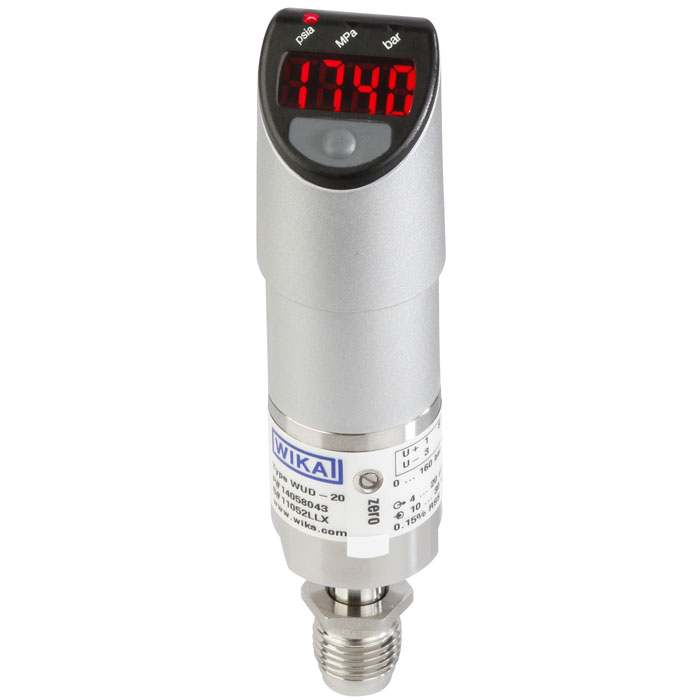 Pressure measurement, based on a true vacuum reference, and electronic measures for interference shielding and signal noise cancellation ensure high-accuracy pressure measurement and excellent long-term stability. Active temperature compensation reduces the impact of changing temperatures on the transducer, allowing safe operations even in applications with high fluctuations in temperature, e.g. Joule-Thomson effect in the case of gas expansion. WUD-25 (flow through) and WUD-26 (surface mount)transducers are specifically designed to sustain torsionapplied stresses often incurred during installation. The special design of the thin-film sensor eliminates the risk of sensor failure due to loads at the process connection or welded joints. The WUD-2x can be readily installed in “on-tool” gas distribution systems. The bright LED display is rotatable and easy to read from any position. Application-specific monitoring and control operations can be realised via two programmable switch outputs. With its small footprint the WUD-2x is the most compact UHP transducer in the market. Thus it is optimally suited for installation in applications with limited mounting space, and even in existing plants it can be easily retrofitted.